It is with sadness that I announce the passing of Jay Cole Simser. Jay passed away on January 17th, 2019 following a surgery on January 7th that he was unable to recover from owing to underlying health problems. He was 77 years of age. Following his wishes, Jay was cremated. A service or remembrance is tentatively being planned for mid-May 2019 in Ames. Details regarding services will be updated at www.adamssoderstrum.com where condolences may also be left. Adams Funeral Home is assisting the family with arrangements. Jay was born in Ames, Iowa on November 13, 1941, the son of Aloys N. Simser and Ruth Cole Jackson. Jay’s elementary education was in Ames. One of his childhood friends from elementary school was the famous actor Nick Nolte (see the Ames Historical Society for the full story). Jay graduated from Gilbert High School in 1959. While in High School Jay tutored kids who were having trouble in school. He then enrolled in Iowa State University as a business administration major for a time but left to work for a year while he decided what to do with himself. During this time he began to teach a Sunday School class at the First United Methodist Church in Ames and worked with the Methodist Youth Fellowship. The curriculum book he used said to teach students how to take pies and cakes to neighbors who had had deaths in the family. Jay began to teach other things as well. It was during this time that Jay decided to be a teacher. He transferred to the State University of Iowa (now the University of Northern Iowa). He started out to be a social studies teacher. However Dr Bernice Lamb got a hold of Jay and reportedly told him that there was a need for more male influences in the lives of children. She pointed out to Jay that at the time children spent most of their time with mothers and female teachers. Jay switched to Elementary Education, never regretting it, and graduated in 1965. Jay began his teaching career in Marion, Iowa with the Linn-Marr School District from 1965 to 1969. In 1969 he moved back to Ames and began teaching in the Ames School District. He taught at Whittier School until he moved to Roosevelt Elementary in 1977, which was the same school where his great aunt, Avis Cole, taught for 40 years. In 1982 he moved to Edwards Elementary School where taught until his retirement in 2003 having spent 38 years teaching 5th and 6th grade. In the 90s Jay also taught Sunday School and was first reader at the Christian Science Church in Ames, Ia. Jay was a proud advocate for teachers and was active in many education related organizations; Past Secretary of the Linn-Mar Education Association, Past President of the Ames Education Association, delegate to the Iowa State Education Association and National Education Association. Jay would admit there were better teacher than him, but he was proud to be a teacher and felt that it was in his nature. One of the things he was proudest of was being named to Who’s Who in American Education – twice – and also being a Sam’s Club Teacher of the Year. Jay’s example heavily inspired his only nephew to go into science education. Jay was very active in the Masons for most of his life. A detailed list of his accomplishments and honors in the Masons could easily double the length of this testament to Jay’s life. Jay joined the Masons April 20th, 1966 in Trojan Lodge in Marion Iowa. In October 4th, 1966 Jay joined Eastern Star. In 2016 he became a 50 year Mason and member of Eastern Star. In 1976 he joined Scottish Rite and in 2010 received honors for his time with them. He was a proud member of the St. Bartholomew Conclave Red Cross of Constantine where he served various leadership roles in Iowa. Jay achieved numerous ranks and served numerous leaderships roles over the year. 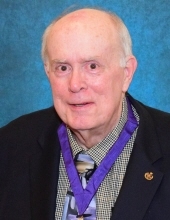 For instance he served as the Masonic Youth Committee for the Grand Lodge of Iowa from 1984 to 1989 and as a member of the Public Schools Committee from 2008 to 2010. In 1994 Jay was “Mason of the Year” for Arcadia Lodge. He was a past chair of the Iowa Masonic Cooperation Committee. The masons and teaching were the most important accomplishments in Jay’s life. Over the years Jay was also active in various theater groups including the Cedar Rapids Community Theater, Ames Community Theater, and Ames Children’s Theater. Jay donated to many charities promoting social justice, animal welfare, and environmental protection. In his later years Jay adopted a number of dogs from Animal Rescues. Jay also enjoyed traveling going on trips all over the United States and having visited Canada, Mexico, Egypt, and Greece. Jay is preceded in death by his parents. He is survived by one sister, Virginia (“Ginny”) Ruth Jackson of Ames, Ia; nephew, Jonathan Cole Jackson and his wife Marryann Elizabeth Barnes, and a great-nephew, Owen Richard Jackson of Tempe, Az. In lieu of flowers, memorial contributions can be sent to Jonathan Jackson, C/O Richard Read PO Box 336 Hubard, Iowa 50122. To send flowers or a remembrance gift to the family of Jay Cole Simser, please visit our Tribute Store. "Email Address" would like to share the life celebration of Jay Cole Simser. Click on the "link" to go to share a favorite memory or leave a condolence message for the family.